WASHINGTON, DC, April 6, 2011 (ENS) – The U.S. Environmental Protection Agency is awarding grants totaling $550,000 to five organizations to implement new approaches in managing bed bug problems. These grants will be used incommunities where bed bug pressures are significant but resources to address the problems are limited. Because financial resources are increasingly scarce, the EPA says it is crucial that all facets of government, industry, and academia work together efficiently. Bed bug control that works takes active participation and cannot be done in isolation, especially when multi-unit housing is involved. Collaboration and communication among all stakeholders are critical to minimizing cost and maximizing control at the community level. Through this grant project, EPA is making funds available to facilitate this interaction and collaboration. Lessons learned from the grants will be shared with other communities. A group at the University of Missouri St. Louis will develop training materials for working with building inspectors and social service agencies that serve low-income minority and immigrant neighborhoods in the metropolitan St. Louis area and directly with residents in those communities, to address existing bed bug infestation problems and proactively avoid a larger contamination problem. The work will translate existing information about bed bug control, prevention, identification and resources to a smartphone-friendly website. Texas AgriLife Extension Service, Texas A&M University will conduct an integrated pest management program at homeless shelters in Texas. The project will demonstrate the effectiveness of best management practices, including monitoring, mattress encasements, structural modifications to reduce harborage and facilitate inspections, quarantine protocols and treatment of belongings and furniture with a portable heat unit. Limited use of insecticides to treat cracks, crevices and voids in areas that cannot be treated with physical or mechanical control methods may be conducted as well, but not with grant funding. Maryland Department of Health and Mental Hygiene will develop and provide training as well as technical and material support to residents, service providers and retail operators in the 12 poorest zip codes of Baltimore city and county health offices throughout Maryland. The grant will also provide training to the migrant workers of Caroline County, who are especially vulnerable to bed bugs. Efforts will promote reduced-risk and non-chemical methods of control that residents can use in their own homes. Rutgers University will implement a statewide bed bug educational outreach program for low-income communities in New Jersey. The grant will help implement a train-the-trainer program in at least 50 low-income communities in New Jersey, assist an affordable housing community in setting up an effective and sustainable community-based model bed bug IPM program. The IPM model will focus on community participation, early detection, maximize cultural and non-chemical control practices, and use of low-toxicity insecticides to manage bed bug infestations. The Michigan Department of Community Health will develop an education program focusing on the prevention and treatment of bed bug infestations for public health professionals and community partners with the goal of preventing pesticide misuse. The program will target the most vulnerable of Detroit’s communities for outreach and education efforts. 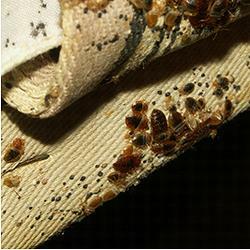 Infestations of bed bugs have spread to many cities around the United States in recent years. As part of the Federal Bed Bug Workgroup, EPA helped develop a national Bed Bug Summit in early February. The agency has worked with various federal agencies to explore and develop techniques for combating the influx of bed bugs. The bed bug grants are a further step in educating consumers and professionals about the pests. Click here for more information on bed bugs.